Woo-hoo! It’s LEGO The Simpsons™! Recreate hilarious scenes from this classic animated TV series The Simpsons™. 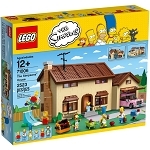 This is a BRAND NEW set of LEGO® Simpsons 71006 The Simpsons House from 2014. This set is still factory sealed and the box is in very good condition with minor shelf wear. 2523 pieces, 6 minifigures©.